The Midwives of New Jersey invite you to plan your conception with purpose!! Our program is designed to the pre-trimester of pregnancy that will lead to an easier and healthier conception, pregnancy, birth and baby! Why is the How to Make a Baby Program™ Important? As Pregnancy and Women’s healthcare experts, we have noticed a substantial increase in the number of couples challenged with fertility issues, pregnancy complications and babies with anomalies. We, along with many other natural health experts, have evidence that this rise is directly linked to American lifestyles, toxic environmental exposures and difficulties with achieving true emotional, physical and spiritual intimacy in relationships. Be aware, there is so much more to preparing for pregnancy than just taking prenatal vitamins! Our team has developed the How to Make a Baby Program™ to guide you in your journey to conception, with intentional choices that will affect you, your partner and your future child’s health. What is the How to Make a Baby Program™ About? Our goal is to guide you to optimal wellness with pro-active daily choices about how to eat, exercise, make love with your partner, deal with stress and create top-notch eggs and sperm. These choices improve the likelihood of a natural conception and, therefore, you will know How to Make a Baby without outside intervention and with the best possible outcomes. Investing in your health during this time is a choice that will give back to your family for generations. 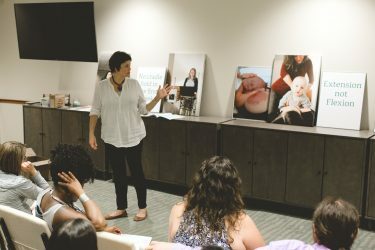 This unique program explores the value of intimacy, stress management, body movement, detoxification, key nutrients and supplementation, as they relate to your ability to conceive a healthy, viable child. We will review societal trends related to fertility and discuss ways to recognize your time of peak fertility. Both partners are encouraged to attend this two-night event. Who Should Attend Our How to Make a Baby Program™? Couples who would like to conceive a child in the next 4 months to a year. Couples who have had fertility challenges in the past and would like to prime their bodies for conception. Couples who do not have fertility challenges and would like to optimize their health in preparation. Couples who are planning their first child. Couples who are planning a subsequent child. We do recommend you attend our program at least 4 months prior to attempting conception. What Does the How to Make a Baby Program™ Include? A two-night informational session for both partners. Sessions will run monthly in the evenings and are scheduled through our office. Please call (908) 509-1801 or Click Here To Register. A Preconception visit and physical exam with our Nurse Practitioner, Veronica. You will discuss any specific concerns related to your family or health history. We will discuss appropriate diagnostic testing based on your health and history. A comprehensive guidebook highlighting key information covered in our program along with valuable resources that will support you in this journey. We are offering an introductory rate of $300 for a limited time. Space is very limited, so please be sure to book your spot at your earliest convenience. 1 in 8 couples in our country will be faced with infertility? That there has been a 75% decline in quantity and quality of Sperm counts over the past century? Did you know that an average, infertility treatment cycle can cost anywhere between $12-20,000 with only a 40% chance of success? When you consider our overall decline in health as a society, with more adults and children coping with the reality of chronic and autoimmune diseases, obesity and chronic stress, there is no wonder that infertility is on the rise. The genetic modification and over-processing of our food sources, and exposure to toxic elements in everyday life have certainly contributed. It’s not surprising that fertility challenges would be more prevalent in today’s world. We are offering this unique opportunity to improve your own and your partner’s health. The steps we have outlined will assist your body in doing what it was designed to do naturally… Make a Baby. Conceive your baby with confidence! Prepare and nurture your body using the information from our Program! Click here to invest in your health today!! Please email conception@midwivesofnj.com with any questions about the program.